We are currently developing high performance DC/DC converters for hybrid/electric vehicles. ApECOR has developed several core technology advancements for high-power DC/DC converters, which has been demonstrated with the completion of an Army Phase II SBIR contract. Our converter technology is currently under refinement, as we are developing a modular commercial off-the-shelf (COTS) DC/DC converter capable of performance well exceeding current technology. Our converter uses proprietary digital control methods to significantly increase efficiency by achieving fully soft-switched IGBT operation. Furthermore, the controller is able to vary the switching frequency under different load conditions, to produce a nearly flat efficiency curve from 15% load to 100% load, while still maintaining >90% efficiency at 2.5% load. Our converter is capable of operating with 100°C coolant temperature. This is possible due to the high-efficiency soft-switching operation, and the use of high-temperature inductor technology. High temperature coolant capability enables the converter to operate on the main coolant loop, removing the need for a dedicated electronics cooling loop. The converter is a modular system, designed to be configured in 100 kW increments. The two 100 kW modules communicate with each other to achieve interleaving and current sharing, decreasing the current ripple and reducing the necessary bus capacitance. This allows for a significant reduction of bus capacitors and conductor size. The high efficiency operation increases the power handling capability of the modules, further increasing the power density of the converter. Each converter module is a fully functional converter, capable of standalone operation. The modules include CAN communication between each module, as well as a separate CAN communication interface to the vehicle system controller. The converter can dynamically switch between output voltage regulation (OVR), input voltage regulation (IVR), and input current regulation (ICR). Digital control allows for active tuning of the controller parameters during OEM installation, which allows the converter to be used in most applications without requiring customization. Currently this converter is available as a 100kW and 200kW unit. 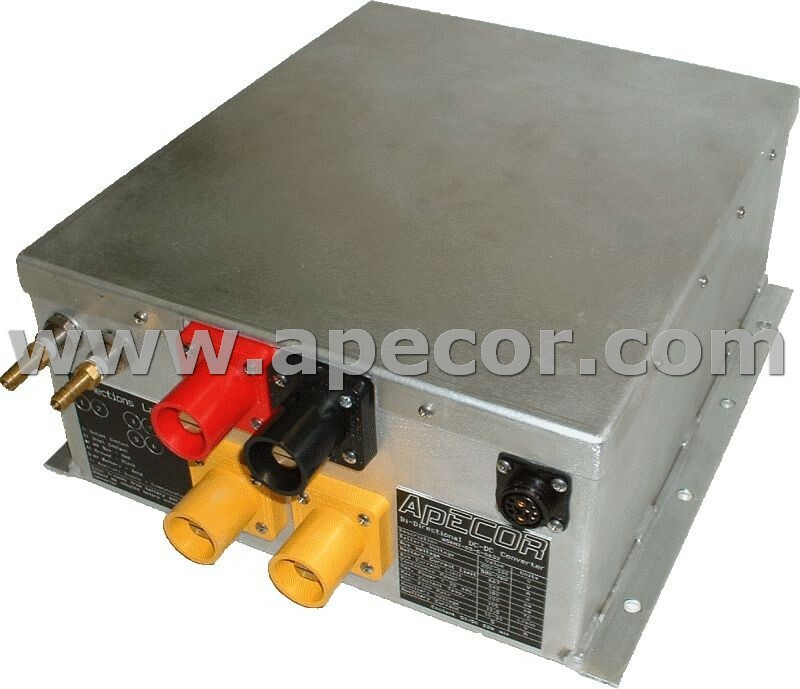 Upon request, ApECOR can customize the converter to satisfy higher or lower power requirements. Please contact ApECOR for a quote!